What content is TikTok’s burgeoning young audience most interested in? In a word: fun. Hashtag challenges and lip synch contests have become the platform’s vernacular. The app has placed a heavy focus on artificial intelligence, meaning the algorithm learns quickly and is custom-tailored to each user’s tastes. There also isn’t much pressure for users to build a large following—at least not in the same way that Facebook, Instagram and Twitter have quantified influence. Before social media, an exchange between a PR pro and a journalist was akin to what goes on in Vegas. It stayed in Vegas. Now, though, some reporters seem to revel in exposing the miscues of communicators, writes Frank Ahrens, the former VP of corporate communications at Hyundai Motor and now a VP at BGR PR. Pro tip: Write email pitches with the understanding they could turn up on social media. Facebook made headlines this week with two major announcements: First, the tech giant is pursuing legal action against companies that sell fake followers and likes; secondly, it plans to blur the lines between WhatsApp, Messenger and Instagram in order to allay privacy and usability concerns. It was also recently revealed that Facebook is entering the cryptocurrency game. So, how will these changes impact professional communicators? The use of influencers is such a new tactic, there’s a lack of agreement on what exactly an influencer is. 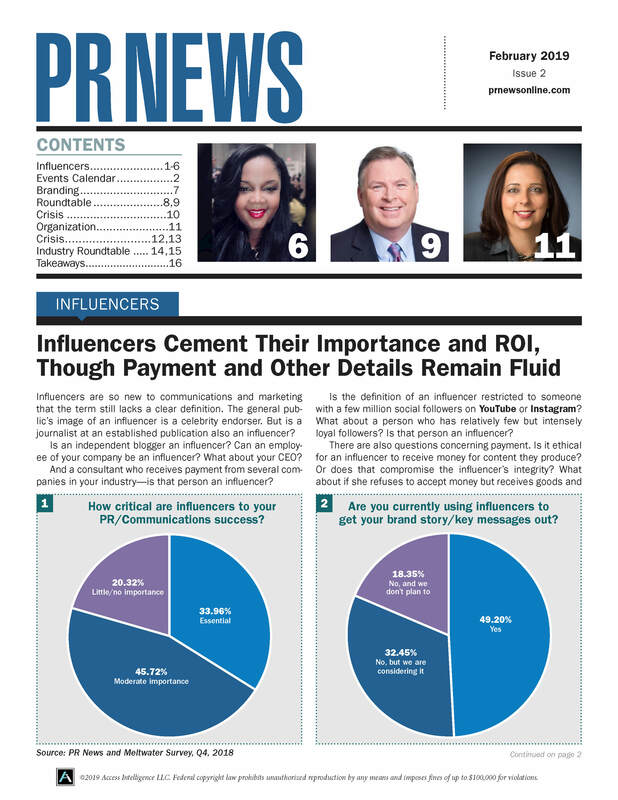 There’s plenty of agreement, though, about the popularity and importance of influencer marketing and communication, a new survey from PR News and Meltwater shows. The survey also finds brands’ and organizations’ budgets for influencer spending are holding steady or rising. Developing a social listening campaign is an important part of any communications strategy, as it can point to new trends as well as be invaluable as a crisis and issues management tool. But thanks to technology, it need not be difficult. Here are some tools communications professionals are using to ensure they know what is bubbling about their brands on social media. With March Madness permeating the zeitgeist in a few weeks, we asked some of the 2018 PR News Rising PR Stars to answer our roundtable questions this month. We asked, “What gets you mad about PR and communications?” And, “What can be done about it?” Their edited responses follow. A trio of new studies tell you the best time and day to pitch your stories to media, why scalability is a concern with influencers and a common concern among PR’s women and men. This week, Facebook announced the launch of its “Showcase” feature, a program that allows brands to advertise on popular Facebook Watch videos. While the feature is referred to as a “premium video ad program” (read: big-ticket item), it’s important for brands of all sizes to note the direction in which Facebook’s advertising business is headed. Here are some takeaways from the feature announcement for brand communicators to be aware of. Executives from APCO Worldwide studied the campaign against Nike and Colin Kaepernick on Twitter and found it wasn’t as widespread or authentic as it seemed at first glance. They conclude that brands should avoid rushing to respond to what appears to be negative social sentiment. Instead, they urge brands to study the elements behind anti-brand content before responding.